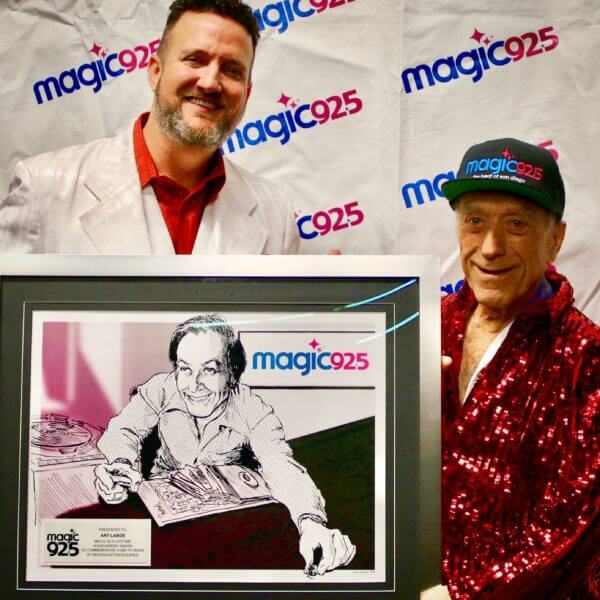 R Dub!, Sunday Night Slow Jams host and Director of Programming for Magic 92.5 in San Diego, presented the station’s first-ever “Magic 92.5 Lifetime Achievement Award” to radio broadcasting veteran Art Laboe on Saturday night, February 9th, at Pechanga Arena in San Diego. The award recognizes the legendary broadcaster’s many achievements over his legendary 75-year radio broadcasting career, and was presented in front of an audience of over 6,000 people. Laboe was one of the first DJs to play Rock ‘n’ Roll on the West Coast, was one of the first to do dedications on the radio, and coined and trademarked the phrase “Oldies but Goodies”. Laboe still broadcasts on Magic 92.5 every Sunday from 8pm-10pm, as well as on over a dozen other radio stations throughout California and the West Coast. The entire Magic 92.5 on-air staff joined Laboe on stage, surprising him in-between acts at the station’s 2019 Valentine’s Super Love Jam concert. “What an honor to receive the first-ever Magic 92.5 Lifetime Achievement Award! Great to have the entire Magic 92.5 team in the house! Thank you to all, especially my good friend, R Dub!,” Art Laboe shared. “Art Laboe is nothing short of a living legend. We’re so happy he’s a part of the Magic 92.5 family and we were incredibly proud to present him with the station’s very first Lifetime Achievement Award. No one could deserve this recognition more. Art is adored and revered by both his listeners and the radio community and has certainly been an inspiration for me and Sunday Night Slow Jams, and to so many others in our industry,” R Dub! added. Laboe has been honored with a star on the Hollywood Walk of Fame and was inducted into the National Radio Hall of Fame in 2012. The City of Los Angeles declared ‘Art Laboe Day’ twice, in 1981 and again in 2015.